Wow! I haven't heard of this brand, but it's USDA-certified organic and the price is definitely right! 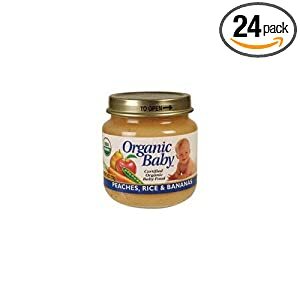 Amazon is currently featurin a 24-pack of Peaches, Rice & Bananas baby food for just $10 when you order with Subscribe & Save. At just $.24 a jar, I'd definitely be ordering a pack of these If my little ones still ate purees. Any idea what the exp date on these is? My baby isnt due till march so a long way to go till she is on solids – hahah – but what a good deal!!! Sorry…I have no idea. You could try emailing Amazon’s customer service to see if they can find out. Thanks so much for this deal. This is a great price for any baby food, organic or not! I have bought this brand at Whole Foods in the past. This is a great deal! Although I can’t find it either. Maybe I’m too late? ?